A smart and robust soccer, sports and entertainment streaming service in the USA. The following is a list of channels available to subscribers to the basic fuboTV package. Please note that the availability of some channels may be limited by specific region. CBS (Select Markets), FOX (Select Markets), NBC (Select Markets), Telemundo (Select Markets) and The CW (Select Markets). A&E, AMC, BBC America, beIN Connect, beIN Sports, beIN Sports EspaÃ±ol, Big Ten Network, Bravo, Cartoon Network/Adult Swim, CBS News, CBS Sports Network, Cheddar, CNBC, CNBC World, CNN, Cozi, E!, Eleven Sports Network, Food Network, FOX Business Network, FOX Deportes (Limited Hisp. DMAs), FOX News Channel, FOX Sports 1, FOX Sports 2, fuboTV Network, Fuse, FX, FXM, FXX, FYI, Galavision, Golf Channel, Hallmark Channel, Hallmark Movies & Mysteries, HGTV, History, HLN, IFC, Lifetime, LMN, Local Now, MSNBC, Nat Geo Wild, National Geographic, NBA TV, NBC Universo (Top 50 Hisp. DMAs), NBCSN, NFL Network, Olympic Channel, Oxygen, Pac-12 Network, Pop, Smithsonian Channel, Sundance TV, Syfy, TBS, TeleXitos, The Weather Channel, TNT, Travel Channel, truTV, Turner Classic Movies, Unimas, Universal Kids, Univision, Univision Deportes Network, USA, Viceland and WE TV. fuboTV is one of the leading sports streaming platforms in the US with an emphasis on top soccer / football competition coverage. It has continually improved year on year and continues to aim higher to become the number one sports OTT service in the USA. Here at LiveSoccerTV, we have been using fuboTV since its debut and have seen continual improvements in the product’s design, features and streaming ability and capacity as well as the addition of new channels, soccer content and sports-related user features. 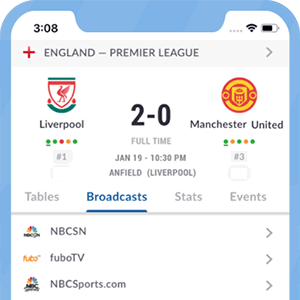 fuboTV offers users a great viewing experience with some great features such as Program Guide, Match Schedules, DVR and a Notification Feature. The fuboTV service, is a great option to consider for cord-cutters. We suggest you start out with the free 7-day trial to get a feel for the product and make your own decision.